Witnessing the creation of new music as it happens is one of the best experiences one can have whether you’re a musician or a spectator/listener. On TALES FROM THE EARTH, multi-instrumentalists Mark Weinstein and Omar Sosa got together with some of their most revered collaborators to create a wonderful collection of 14 songs that will move you, make you happy and refresh your spirit. Opening with “Sunrise,” the song is an appropriate homage to the beauty of daylight breaking across the horizon and awakening the inhabitants of Earth. Following by the prayerful “Invocation,” which instills a feeling of gratitude to the Creator, the marimba, played here by Omar Sosa, and the flute, played by Mark Weinstein, share a dance of peace and spirituality that will refresh your spirit. The music of Africa is as rich as the inner souls that inhabit her and here, the African sounds interact with dialogue and evolve into unique musical conversations among balafon virtuoso Aly Keita, guitarist Jean Paul Bourelly, Stanislou Michalak on bass, drummer Marque Gilmore, vocalist/percussionist Aho Luc Nicaise and Mathias Agbokou. The stories told on TALES OF THE EARTH are astounding and immediately conjure up the beauty, exoticism, wilderness and peace the great Mother Continent has to offer her children. Peace and love. Buy TALES FROM THE EARTH right now! Simply click on the CD cover image. Weinstein’s most recent release demonstrates his commitment to the flute in world music in his own work. And it was a big commitment. His previous sessions have drawn on the New York/New Jersey music community to find expert exponents of these various genres, from Cuba or Brazil for example, who have helped him assemble material and ensembles to record it. In this case, however, Weinstein went much further afield. Amazing indeed! I have been disappointed by a lot of the free music I have heard recently. Having worked in that genre with the Spontaneous Music Ensemble of London and others in the early 1970s, I have not much that has changed in that field in the subsequent 35 years. Too much free music is not really free–it falls in a very narrow stylistic range, creating a box for itself that it can never seem to break out of. And few free players seem to pay attention to dynamics, shape, nuance–in short, to musicality. Tales From The Earth has a distinctly different character, primarily because, while it is free music, it is grounded in a traditional music tradition. Several tracks begin with the two African drummers and builds from there, with the other instruments, percussion, strings and eventually flute, laying down melodic and cultural layers on top of them. Other selections open with bass or flute but the rhythmic framework is never far away. Consequently, this cannot be said to be totally free music. The combination of African sensibilities with free jazz produces a genre of its own; this is certainly not African music in its pure form, and the freedom of the jazz players is curtailed by the structures that the more traditional musicians impose. But the various influences dovetail beautifully, and all of them create a perfect foil for Weinstein’s flutes. It should be added, of course, that the African influences are reflected in Omar Sosa, the Cuban, whose mallet work on vibes and marimba is central to much of the improvisation. The status of Cuban music as part of the African diaspara is well known. It is reinforced here, especially in the expression of historical and religious connections heard on the second track, Invocation, where, as Weinstein puts it, “three sons of Africa, one Cuban, still held to the same religion, and could join together in prayer.” One manifestation of the sense of unity that pervades this session. There are, of course, purists who will object to this, considering it an aesthetic requirement to present free improvisation as it occurs, warts and all. But one might equally insist on reviewing, hearing, or reading early first drafts of great symphonies or novels, or of seeing raw footage before it is edited to create a movie. As a musicologist and, in an earlier incarnation as a literary critic, I have done my share of that, and I wouldn’t recommend it. Editing is part of every creative process, unless you are a pure genius like Mozart or J.S. Bach whose original manuscripts show few, if any, revisions. Beethoven’s notebooks or Da Vinci’s cartoons are of interest to musicologists and art historians. It is the finished symphony or painting that the artist wants the public to enjoy. In this case, the music we hear is the result of careful planning, spontaneous performance, then meticulous editing. The end result is what it is. Those who wish to experience free music in the raw should go hear some live music. Those who want to a fine example of the interface between jazz and world music should check out Tales From The Earth. Most people associate Africa with a variety of musical styles, but in many cases, they simply can’t establish a concrete connection between African music and genres from her Diaspora. Much of the problem lies in a lack of common knowledge about authentic African music. While many listeners may recognize sound bytes, they simply lack a working understanding of West African traditional or popular music. At the same time, music from the African Diaspora generally reflects a very different personality than the sound bytes that live in most people’s consciousness. When West African citizens were brought into the New World, slavery shattered their musical foundations, and the pieces formed the basis of jazz, funk, salsa, rumba, and soul; these resultant styles only revealed traces of their African heritage. For the listener, the connection between Africa and her Diaspora remain an intangible relationship; for the musician, it becomes an artistic mystery without a simple answer. As the musician performs each of these different styles, they start to unlock different pieces of the puzzle. In order to honestly build an understanding, they need extensive experience in each style, and they often need to perform some serious research. Projects that bring these worlds together require immense dedication from all involved musicians for any chance of a successful blend. Flautist Mark Weinstein and pianist/mallet player Omar Sosa draw upon their years of deep performance experiences to build an intriguing blend of African music, jazz, Cuban styles, and more on Tales from The Earth. Weinstein takes the opportunity to explore improvisational ideas over African influenced settings on many tracks. Vocalists Aho Luc Nicaise and Mathias Agbokou enter with a Santeria chant on “Invocation,” leading into an addictive groove from drums and percussion while balafon player Aly Keita improvises. As Keita settles into a steady groove, Weinstein freely creates melodies, weaving in and out of the thick texture. Sosa follows Weinstein’s statement with an assertive vibraphone solo that cleverly plays upon the percussive drive of the group. A 6/8 bell pattern segues into a melodic ostinato from Keita on “Walking Song,” as drummer Marque Gilmore changes the texture with a backbeat. Weinstein allows flowing lines to float over the active texture, creating a sense of liberty and openness to his improvisation. As Weinstein continues to explore the setting, Nicaise begins a traditional song, which creates an interesting contrast to the flute solo. Bassist Stanislou Michalak intersperses bluesy licks in between rich double stops on “Elders Speak” as Weinstein furiously improvises. The exchange between the two musicians grows more intense as they both raise the intensity of their ideas, complimented by brash percussion accents. Michalak and Weinstein reach critical mass as the percussionists join with a groove, driving the improvisations into a chaotic flight of wild phrases. A sea of bells and sparse balafon phrases provides a thin backdrop for a melodic improvisation from Weinstein on “Flirtation.” As Weinstein builds his ideas, Gilmore falls into a broken funk and Michalak infuses a rootsy blues feel into his bass line. The three musicians continue to stretch their conception, moving the music into an interesting combination of African derived aesthetics. These songs find Weinstein winding his improvisational voice around this unique setting, which inspires some impressive work. Several pieces feature vocals prominently, calling upon a number of traditional songs and chants within an improvisational context. Nicaise begins “River Crossing” with a strong and confident song until a flurry of percussion storms into the mix amid subtle improvising from the rest of the band. The song takes on a definitely different feel as it moves over a funky drumbeat, jazz-fueled bass fills, and repeated balafon patterns. Sosa pushes the song into a furious forward motion with the smart insertion of quick improvised lines and sharp accents on the vibraphone. A thick layer of closely intertwining percussion patterns leads into understated improvising from Weinstein, Michalak, and Keita on “Men’s Talk.” As the drummers fade into the background, Nicaise leaps into a powerful traditional song, moving forward as the band improvises around him. The group cleverly plays with texture as Weinstein makes an improvised journey through the diverse musical landscape with lush elegant lines. A Cuban rumba pattern burns beneath an impassioned improvisation from Weinstein on “Spirit Messenger.” Nicaise and Agbokou enter with repeated phrases that frame Weinstein’s solo, which quickly reaches a furious drive. The band breaks down to racing percussion and vocals, leaving the song in a traditional mode, making the connection to Africa very apparent. The inclusion of vocals on these tracks connects the work more explicitly to African traditions, making the link with music of the Diaspora even stronger. Other pieces lean the group towards implications of the African Diaspora by emphasizing different musical elements. Guitarist Jean Paul Bourelly establishes an assertive funk line over a 6/8 rhythm while Sosa keeps a steady marimba pattern on “Children At Play.” Bourelly pushes the band into high gear with a rock-tinged chordal pattern while Weinstein enthusiastically improvises. Sosa dives into an energetic statement, drawing off the band’s forward motion and inspiring some active response. Gilmore’s laid-back drum groove, Sosa’s rich vibrato chords, and Weinstein’ long flute tones infuse “Celebration” with a soulful funkiness. Weinstein plays upon this vibe with the deep rich tone of his bass flute, spinning bluesy lines full of long wandering phrases. Sosa lets the percussion ride their groove before slowly entering into a vibraphone solo, which he builds into a thick frenzy of notes. A gospel-tinged soulfulness fuels Bourelly’s Motown influenced guitar groove and Gilmore’s ultra laid-back groove on “Praise.” The group follows this groove with a hypnotic faithfulness while Sosa inserts lush shimmering chords and Nicaise improvises an inspired vocal. A syncopated balafon ostinato explodes into a massive groove on “Gratitude” as Gilmore hits a heavy funk beat and Sosa nails a catchy marimba vamp. Sosa gradually opens his line into an engaging solo, which pushes the band with a sense of addictive enthusiasm and an upbeat attitude. Both Nicaise and Agbokou interject short vocal phrases that playfully move around the band’s unstoppable groove. These songs demonstrate the vast range of African influence in several contemporary musics, and they highlight the musicians’ vision between the different genres. Weinstein and Sosa find organic connections between African music and styles from the Diaspora on Tales from The Earth, delivering a wonderfully creative statement of African identity. The album draws extensively upon improvised settings, wisely disregarding the notion of a composed tribute to the country. Without the crutch of a pre-composed score, the musicians draw upon their most natural musical instincts. Weinstein and Sosa gathered an interesting group of musicians that cut across African and the Diaspora; their first instincts naturally result in authentic connections to Africa, Cuba, and beyond. The improvised setting brings the best pieces of jazz improvisation into the forefront, allowing the musicians to escape the trap of complex chord changes and simply express their personal identities. Both Weinstein and Sosa appear completely at ease in this context, producing both relaxed and intense music that draws upon the organic connection and tension between Africa and the Diaspora. Keita contributes a strong connection to African music with a wealth of authentic balafon patterns that blend into the music perfectly. Michalak and Gilmore add a healthy dose of tension into the mix, emphasizing their connections to funk, soul, and jazz. Nicaise and Agbokou provide a strong bridge between musical worlds, throwing equal doses of Cuban Santeria chants and African percussion into the music. With all these pieces in place, Weinstein and Sosa let all the musical elements freely interact on Tales from The Earth, resulting in a beautiful musical statement that brings the connection between Africa and her Diaspora into a clear light. Omar Sosa, a Cuban pianist from the Bay Area, is all long robes and Santeria candles as he pursues a modern fusion informed by jazz, Afro-Latin roots and hip-hop culture. Brooklyn flutist Mark Weinstein has focused on postbop and Brazilian jazz on recent discs, each of which includes a fragment of Hebrew scripture on the sleeve. The Hebrew appears again on Tales from the Earth, a new collaboration that exudes the mystery and authentic street energy of Afro-Cuban music while reconciling the idiosyncrasies of both coleaders. In 1967, when Sosa was two, Weinstein (then a trombonist) recorded Cuban Roots, an influential session with Chick Corea. 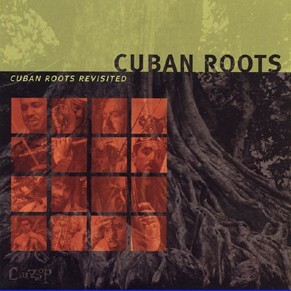 Soon after his mid-’90s comeback as a flutist, Weinstein offered Cuban Roots Revisited, featuring Sosa. Tales is a reunion, but here, in a first, Sosa plays mallets. He locks in layered marimba patterns to complement Aly Keita’s balafon, and uses vibraphone and minimal piano for harmonic color and subtle solo inflection. Drummer Marque Gilmore (of Sosa’s Afreecanos Quartet) builds a bridge from traditional rhythm to splintery, cutting-edge beat-making, and bassist Stanislou Michalak keeps his lines fittingly sparse. Weinstein’s entrancing alto and bass flute work adds a sonorous darkness on several tracks, balancing the lively percussion and vocal incantations of Aho Luc Nicaise and Mathias Agbokou. Tales is also stamped with the earthy, stinging guitar of coproducer Jean Paul Bourelly, whose riffing on “Children at Play” sounds like a guimbri, straight out of Africa. Tales from the Earth by flutist, Mark Weinstein and pianist/vibraphonist, Omar Sosa, is one of the most extraordinary musical expeditions in a long time. The need for a subtext is not necessary; the extraordinary depth and ethereal beauty of the music would suffice. Nevertheless, once that subtext becomes evident, then the music touches parts of the body that much music might not. There is really no beginning and no end; this musical continuum needs only be entered with eyes wide shut and ears open; listening with the heart, soul, and every pore of the being is essential. Perhaps it is the result of a childhood epiphany, which Weinstein recalled years later. Like epic music that is worshipful and healing, profoundly hypnotic as an interminable dance, it simply skips and rushes, cartwheels and catapults. The notes and phrases are alive and breathe as they entwine into each other like gilded braid. One strain, an idea, and then the voice of another world of music unfolding-almost like an ocean tumbling in harness. Suddenly drums and kalimbas sing and, with a rumble and thud, quaking of the earth begins. Sadness flows as one of the darkest moments of human history is relived; then, not joy, but resignation-and peace. Such primeval beauty in melody, harmonic and utterly exquisite polyrhythms, slicing through voices that meander in more melodic counterpoint. Weinstein probably imagined something like this all his life, however it is pure chance that brought the flutist together with guitarist extraordinaire, Jean-Paul Bourelly and piano wizard Sosa. The occasion was the Black Atlantic/Congo Square series that Bourelly was organizing in Berlin in 2004. For Weinstein, the opportunity to play with these musicians, as well as bassist Stan Michalak and balaphon master Aly Keita, was the lure. Then the chilling subtext comes into play-the venue for the recording was the same building that was once the Ministry of Information during the Nazi era. For Weinstein the project now must have been one by Divine design and the music reflects just that; none of the music was written. The music appears to have been dictated by a Divine muse and attendant spirits. Nothing else can explain the mesmerizing set that simply flows from track to track. Mark Weinstein’s latest album, Tales From The Earth, is due for release in October on the Otá label. As with every new Weinstein release, you can be sure of something very special. In fact, this album has been a very long time coming and has had me impatient to hear it for the last five years. It was in the summer of 2004 that Mark Weinstein first mentioned that he was going to Berlin to record an album with Jean-Paul Bourelly, Omar Sosa and some African musicians. I was already excited! When Weinstein returned from Berlin he was real excited, and thus my own excitement grew as indeed did my impatience to hear the results. Five years later, we can at last hear the results of some four hours or recording, condensed into just over an hour. Was it worth the wait? You bet! In the summer of 2004, Jean-Paul Bourelly, that monster guitarist who can justly claim the mantle of Jimi Hendrix, already familiar here from his participation on Mark Weinstein’s 2004/5 album Algo Más and 1998’s Jazz World Trios, was involved in organising a festival of African music and the African music diaspora in Berlin. This was an opportunity too good to miss, and Weinstein asked Bourelly to organise a recording session for him while a number of musicians participating in the festival were available. The musicians available for the recording session consisted of, in addition to Weinstein and Bourelly, Cuban piano and mallets phenomenon Omar Sosa (who is co-credited with Mark Weinstein here and whose regular label is releasing Tales From The Earth), best remembered here for his participation on Weinstein’s 1999 Cu-Bop release Cuban Roots Revisited, here playing mainly marimba as well as vibes and piano, balafon virtuoso Aly Keita, Aho Luc Nicaise and Mathias Agbokou on percussion and vocals, Polish bassist Stanislou Michalan and Marque Gilmore on drums. Bourelly’s active contributions to the actual music are limited to two tracks due to sheer exhaustion after the festival, on the final day of which he had played with every performer on that day, not to mention having organised the festival as well as the recording session. While this may somewhat disappoint Bourelly fans, it certainly doesn’t diminish Mark Weinstein’s Tales From The Earth in any way. Bourelly’s contribution in bringing these musicians together in the first place is a major credit to him. The recording itself took place at UFO Studios over a two day period. As it turned out, UFO Studios were located in something of an iconic building in Berlin that once housed the notorious big-mouth Goebbels’ propaganda ministry of the criminal thugs responsible for the holocaust. The fact that this circumstance of having to confront this demonic agony in such an intimate way didn’t stop Mark Weinstein, a Jew, in his tracks is not only near miraculous but also a credit to Weinstein’s resilience. One would hope that such a gathering of ‘Untermenschen’ at UFO Studios would have thoroughly rattled the bones of those thugs once resident there. As for the music itself of Mark Weinstein’s Tales From The Earth, this is not only completely, freely improvised, without any preconceptions or prior ideas, but also goes right back to the very roots of jazz, West African music. All the participating musicians are deeply rooted in and committed to the music of Africa in its various forms, and it is this shared commitment and dedication that provided the basis for their recording session. Tales From The Earth is completely unrehearsed and spontaneous. The album has been edited from about four hours of recorded music, but aside from this editing and sequencing has remained untouched and is ‘as played’ during the session. This process of editing down some four hours, with individual segments sometimes lasting some twenty minutes, to about one hour as presented on the album, and furthermore to come up with fourteen tracks that not only make perfect sense in themselves but also form a wonderfully cohesive and coherent whole, must have been an extraordinarily painstaking and difficult one. The result is a tribute to both the genius of Mark Weinstein and his regular recording engineer Phil Ludwig, who together undertook this mammoth task. With Tales From The Earth Mark Weinstein has taken free jazz to a whole new level. This is free jazz at its very best, free jazz that still makes sense to the listener and that isn’t simply a sequence of more or less dissonant flights of fancy as sadly is so often the case. This music is a series of profound dialogues, steering clear of the conventional jazz solo. Everything is of the moment and in the moment. The resulting evolving conversations are not only coherent and make perfect sense, but moreover are exquisitely enjoyable and compelling. In exploring its African roots, the very close connection of the music of the African diaspora in the Americas and the Caribbean becomes beautifully obvious, the spatial and temporal separation of the musical cultures is shown to be of so little consequence. The very roots of Afro-American, Afro-Cuban, Afro-Brazilian and Trinidadian music (especially ‘tamboo bamboo’ and even the relatively recent steel pan music) are all there, laid bare and made so easy to comprehend. The fourteen tracks on Tales From The Earth are furthermore completely consistent with not a single weak track. As spellbinding as it is compelling and absorbing, as exciting as it is appealing and beautiful, this music is of uncommonly wide appeal. It will please free jazz aficionados and world music fans alike, and beyond. Not all musicians play on all tracks – as already noted, Jean-Paul Bourelly only participates on two, for example. Weinstein himself plays on most, and his flowing melodies are a delight, showing him at his most lyrical yet. At times, he switches between his different flutes on the same track to superb effect, making especially fine use also of his bass flute. Omar Sosa’s marimba in particular also shines, as does Aly Keita’s balafon. The fine lead vocals of Aho Luc Nicaise also need singling out, as do his and Mathias Agbokou’s percussion work. Mark Weinstein, ‘The Man with the Magic Flute’, has once again worked his magic with Tales From The Earth. Always surprising, Weinstein has come up with an exciting album that is charming and haunting and he once again takes the jazz flute to new horizons. Again, Weinstein has given us music that is as completely fresh as it is refreshing. 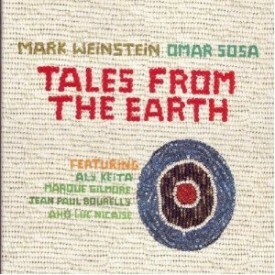 Mark Weinstein’s and Omar Sosa’s Tales From The Earth is an album that’s not to be missed by any lover of good music. As a bonus, it also gives the ghastly jewel case a miss in favour of a beautifully designed card sleeve with plastic CD holder inner. Flautist Weinstein and Sosa on marimba and vibraphone (with an occasional piano piece) are joined by the global ensemble of Jean Paul Bourelly (guitars) Aly Keita (balafon) Marque Gilmore (drums) and vocals and percussion by Aho Luc Nicaise and Mathias Agbokou. Deeply spiritual and moody, these two artists seem to have found new depth in each other’s work. Highly recommended!